This category recognizes exceptional stormwater BMPs installed on a residential property. 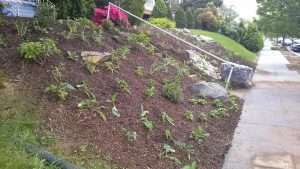 Example projects include: rain gardens, rainwater harvesting, vegetated roofs, conservation landscaping, tree planting, downspout disconnection, soil amendments, and other residential projects. Total investment in a residential BMP should generally be less than $5,000. BMPs installed by homeowners, contractors or watershed groups are eligible (the designer and installer should be identified in the application). Below you will find information about the winners of the Best Residential BMP category of the 2017 BUBBAs. To learn more about this year’s winners, check out the project files on our Google Drive account here. 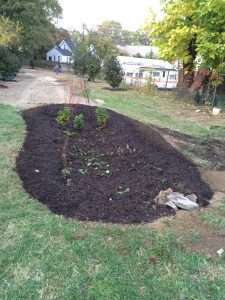 This raingarden and conservation landscaping project, located in a hilly neighborhood in the District of Columbia, exhibits notable stormwater management; aesthetic improvements to the property; creation of significant songbird and pollinator habitat; and is transferable throughout the District of Columbia and across the Chesapeake Bay. The highly visible project is also a certified Monarch Waystation, complete with educational signage. To read a full narrative of the project and view more photos, please visit the project folder on our Google Drive. This project treats approximately 20,000 gallons of stormwater runoff with the removal of 350 square feet of concrete and the installation of a 100 square feet rain garden, two 132 gallon rain barrels, and twelve shade trees. Furthermore, the installation of these practices have significantly improved the aesthetics of the property. 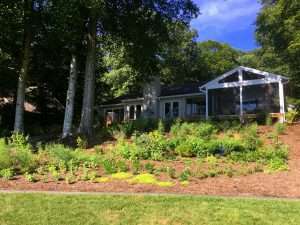 For this project, Mrs. Bailey installed two Rain Gardens (RG), two Dry Wells (DW), and approximately 3,500 square feet of Conservation Landscaping in the form of Mulched Beds and a large Filter Strip along the edge of Lake Loreine. The project provided substantial habitat and aesthetic improvements in addition to providing increased stormwater treatment.